This healing plan will assist you in releasing the misperception that you are not enough and therefore do not have enough confidence. You were born with a complete and full acceptance of who you are. Due to shaming events and experiences, you took on beliefs that you are inadequate or unworthy. These misperceptions block you from feeling the original energy you were born with and create a lack of self-confidence. By reconnecting with the truth that you are loved and worthy, you create a correct perception of yourself, which supports you in feeling confident and self-assured. At the end of this 3-week healing plan, you will have achieved a connection with a natural and constant state of self-love and self-acceptance, which will increase your self-confidence. 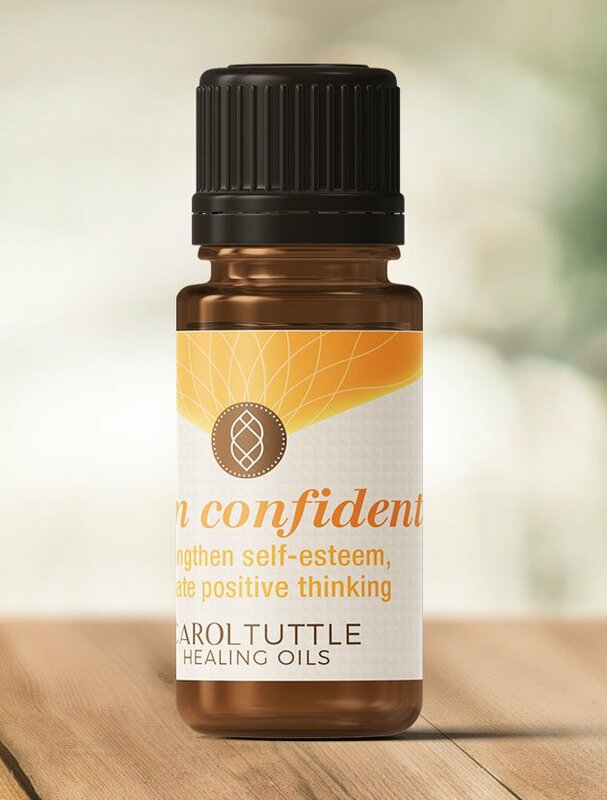 The oil customized to support you in this Healing Plan: I am confident. Under each tab, follow the instructions for healing techniques and sessions. Check off your progress as you go. This process is simple and powerful! Do each of these short exercises every day of this 3-week healing plan. In other words, do these daily practices along with the healing sessions for Week 1. When you move on to Week 2, continue to do these practices daily. The list may look long, but the techniques are quick once you’re familiar with them. Each technique resets your energy so you can experience more self-confidence. Listen here or download and listen on the go. This audio session will help train your mind to think in the affirmative about who you are rather than the negative self talk you are used to engaging in. Positive self-talk is the foundation of self-confidence. Listen here or download and listen on the go. Listening to these powerful affirmations will help you shift your subconscious and conscious beliefs about yourself. Due to many shaming events in your life, you have taken on negative beliefs about yourself that have created negative habits of self-talk. These affirmations will train your thinking mind to have thoughts that align with the truth of who you are. Doing an energy circle for 90 seconds in the morning will help your whole body to shift to a higher vibration of self-esteem and self-confidence. In your Energy Circle, you can use any of the wording from the Daily Script or Affirmations audio sessions. Each day, finish any one (or several) of the following sentences in a journal or notebook. Write quickly. No overthinking. See what comes up. Sound healing, using Tibetan healing bowls, helps you process, clear, and ground your energy. They activate your energy centers to help you express your true self with more ease. Listen to this track while you journal, do your energy circles, while you take a bath, go on a walk, or go to sleep. In this first week of your healing plan, watch each healing session at least one time. Space out the sessions in consecutive days. (All at once is too much!) If you have time, watch each session twice. You can also watch any of these healing sessions at any time when they would be supportive. This general low self-esteem clearing will support you in letting go of shameful feelings and known and unknown beliefs that block your natural, effortless self-confidence. Since you were born with a natural self-confidence and assurance of who you are, this session will assist you in reconnecting with that original energy. It will reprogram your personal energy system to remember your original vibration at birth. You may have compromised your true identity to fit into your family system. This clearing session will help you release any roles or energy you took on to please your family, as well as any residual dysfunctional energy that feeds a lack of self-confidence. You may hold the belief that you “need” validation from others to feel good about yourself and be acceptable. Every time you look outside yourself for validation, you give your power away and keep yourself from feeling effortless and natural self-confidence. The last statement, “I need self-confidence,” is a false belief. You were born with self-confidence and a high esteem of yourself. You always have it within you. It is not something you “need” or have to create, it is just an energy you are now connecting to that has always been there. This live Coaching Call will support you with personal insight from Carol Tuttle as you move through Week 1. You will find answers to common questions that will help you gain more self-love and self-acceptance. Watch each of the 4 healing sessions below at least one time. Watch sessions twice if you have time, or again at any time when they would be supportive. Each day of this week, continue to do the 5 practices under the Daily tab. Watch this session again. Go through the exercise. Set the intention you are going to get more insights and let all of the old beliefs go. Between the ages of 3-6, you needed validation of your personal worth and approval to use your personal power. If this need was not adequately met, you can get stuck looking outside yourself for validation. This session will help you reconnect with your personal worth and sustain it. Mirror work will assist you in removing layers of lies and illusions you have carried about yourself at a subconscious level. It will assist you with creating deep and lasting energetic bonds with your true self and sense of worth, which activates self-confidence. If you were shamed or disciplined for being your true self, you cannot connect with and develop your natural self-confidence. This clearing session will help you release limiting beliefs about yourself and the shame energy that interferes with knowing you really are a confident person. If you do not yet know your Energy Type, watch the Energy Profiling course to determine it. This live Coaching Call from Week 2 will focus on questions you may have as you go through the Healing Plan for Self-Confidence. Carol will assist you in releasing the misperception that you are not enough and therefore do not have enough confidence. Each day of this week, continue to do the 5 practices under the “Daily” tab. Before you move on to this week’s new sessions, go through this exercise again. The repetition helps to ground the new, healthy pattern. If you were taught that it is not safe or appropriate to feel your feelings, you carry both repressed negative feelings to clear, and repressed positive feelings to feel. Along with helping you let go of the negative feelings, this clearing session will help you access positive feelings about yourself, which feeds strong self-confidence. Listen here or download and listen on the go. The audio session for your Energy Type helps train your mind to think affirmative thoughts that align with your natural gifts and tendencies. Using those gifts and trusting those tendencies will create successful outcomes in your life. When you create successful outcomes, you are proud of yourself, which strengthens your self-confidence. This healing session will help you to develop a pattern in your thoughts, feelings, and energy that you are a valuable human being and you deserve to thrive and experience a life of affluence, ease, and joy. This is the 3rd and final live Coaching Call as you work through Week 3 of this Healing Plan. Carol tunes into real experiences from the community and offers guidance so you can recognize patterns in your life. This session helps you create your personalized affirmations. Every essential oil has properties that support specific healing outcomes. The oil blend personally crafted for this plan will support your healing process and make it smoother. Inspires positive thinking, emotional stability, and emotional resiliency. Clears the mind of negative thoughts. Strengthens intuition. Blue Lace Agate: Builds inner and outer strength by helping you become more truly who you are. When you wear Blue Lace Agate, you grow more confident, resilient, protected, and better able to recognize and fulfill your mission in life. Radiant Heart: Radiant Heart comforts your heart and provides stability during emotionally challenging times. It nurtures and heals a heart that has been challenged, betrayed, or otherwise hurt. It helps stabilize your emotions while cultivating the inner strength needed to express or let go of long-hidden feelings.